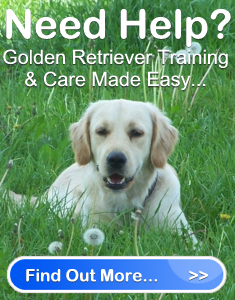 Golden Retriever Care & Training | Golden Retriever Savvy " "
Golden Retriever Care is relatively easy and isn’t something you should worry about. It doesn’t take much to ensure your Golden stays healthy and happy. Providing him with a balanced dog food diet, fresh water, plenty of exercise, and regular grooming, will keep him content and in tip-top shape. Your main concern when selecting a Vet is how logically he or she thinks, and how well they respond to your dog’s condition. Allopathic Veterinarian – This type of Vet believes in treating animals with the use of medications. Some dog owners do not approve of this method, as they think that meds only create more problems by adding further stress on the animal’s immune system. Holistic Veterinarian – This type of Vet believes in using natural healing elements such as medicinal herbs, minerals, vitamins, antioxidants, acupuncture, enzymes and homeopathy for treating dog illnesses. This type of treatment is used to prevent animals from becoming ill by keeping their immune system strong and healthy. When it all comes down to it, neither Vet is better than the other. Therefore, your choice will depend on your own beliefs, and what you think would be best Golden Retriever care method. Nevertheless, before you make any final decisions, you should first thoroughly investigate both types of veterinarians. To find out what veterinarians are available to you in your area, check the local newspaper ads and the yellow pages. You can also ask any of your friends who have animals, what Vet they go to. Remember, you don’t need to choose the first Vet you find. Simply visit the location and speak with the Vet. You’ll likely get an overall feel of the place to see if it’s right for your dog. Golden Retriever care is about keeping your dog healthy, strong and happy. A Veterinarian plays a large roll in the wellbeing of your dog.